Ask fellow campers about "Clayton Lake State Park" and nearby attractions. This is a poor man's oasis. The park itself was one of the best I've ever seen. The facilities were the worst I've ever seen. You come here to get away from it all. The park itself is small. It overlooks a small lake. It is a 20-25 minute drive off the main road. There is no staff here. None of the sites have sewer. The one bathroom is a hole in the ground, and there are no showers. However, the beauty of this park was surprisingly good. It is extremely quiet and peaceful. You drive quite a bit through the open fields, and then all the sudden you come across this small lake. Sites are wide and spacious. My site had a large covered patio. This place was perfect for my one-night stay. Just keep in mind that it is a bit off the beaten path. I would certainly recommend this as a one or two night stay. We camped at Clayton Lake State Park in a Travel Trailer. Used as an overnight stop. The road in is a bit long, and winding. Site was a bit un-level, but I was able to get the trailer level enough while still attached. Utilities worked well. Beautiful area. No shade, but cool in the evening. A bit off the highway, but would probably use again. Lots of Boy Scouts there that weekend. They were enjoying it. Ranger was very helpful. Price reflects on-line reservation fee. We camped at Clayton Lake State Park in a Travel Trailer. Look around. It is a small park, and doesn't take long. Beautiful area. This place was great! The view was fabulous! Definitely take the time to make the hike to see the dinosaur tracks. The rangers were all very nice and came by to chat. Only complaint was that the water in the shower house was very cold. Told the ranger who said he would fix it. Would definitely stay there again! We camped at Clayton Lake State Park in a Tent Trailer. We've got mixed feelings about Clayton Lake. It's a beautiful spot, but there are a lot of caveats. 1) There is no dump station here. The nearest is at the Love's in Clayton. 2) There is effectively no usable Verizon signal here. Even with a booster, we could barely eek out a sliver of data every now and then. 3) Voltage problems. When I plugged in, it was reading 128V. We lost power numerous times throughout the night due to our power monitor shutting down due to an over-voltage. It shuts off at 130V. The highest I saw was 132V. Use power here without protection at your own risk! We enjoyed the short walk to the dinosaur tracks in the spillway. They were pretty neat. Overall it's a beautiful, quiet location, but you need to know what you're getting into if you come here. The showers were acceptable but a little on the icky side. One had really low pressure and the other was like a fire hose. Our cost of $14 is with electrical hookups. It's $10 without.I would say E7 is the best of the electrical sites. It backs up to the lake and has only one neighbor on one side. Ample room for a 32ft travel trailer and disconnected truck. We camped at Clayton Lake State Park in a Travel Trailer. Be sure to check out the dinosaur tracks over the dam spillway. We stayed at this cg on our way home from SW Colorado. We chose this cg because its our halfway point home. We had been here before to see the dinosaur foot prints and had grandkids with us this trip. We didnt camp the previous time. The road to the state park is long, narrow and rough. We arrived after dark and there are no lights along the road or in the park. We had reserved 2 campsites (1 for us, 1 for our son/family) for water/electric sites on the Reserve USA website. The sites were long enough for our motorhome and towed vehicle without unhooking. The sites are nice. The gravel pad was pretty level, there was a covered picnic table with grill at each site with plenty of space between sites. The morning we were leaving we looked for a dump station and were told by employees there isnt one that we could use the on in town at the Loves store. We thought that was odd that the park didnt have one. We did use the one at the Loves but only because we HAD to dump our black tank. Even though its a travel store, that store is not built to accomodate RV's. The parking lot is small and crowded. Rv's are not allowed to use the commercial truck pumps. As we left the state park my husband said "we wont be staying here again". While it is a nice park, I agreed with him. We camped at Clayton Lake State Park in a Motorhome. Dinosaur tracks are worth seeing but we recommend staying somewhere else. Especially if you have a big rig/long trailer. This is a small campground with about 12 RV sites with electric and water. 5 of the sites are pull thru. There are many other sites without hook ups that are avaiable. The roads into the RV sites are good, but the roads in the non rv sites and the rest of the park are in need of repair. The campsites are close to the lake. The night skies are great for viewing the stars. 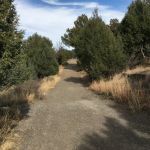 There is also a short hike, I took my bike on the trail, that leads to Dinasour Tracks. 100's of tracks left in the rocks by dinasours millions of years ago. The restrooms and showers were basic. The water presure in the shower was GREAT and the water was HOT! The picnic tables at each campsite, sit on a concrete pad with a structure covering the table from the sun and rain. 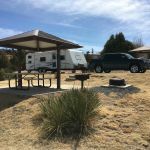 This state park is well worth the 12 mile trek into the New Mexico Grasslands to visit this park. We camped at Clayton Lake State Park in a Travel Trailer. Make sure you take the short hike to the Dinasour Tracks. Or take your bike for a short mountain bike ride! Roads need maintenance. Nice views. 7 electric/water sites. 5 pull throughs. First come first served. No reservations when we were there. Not a bad drive in. Boat ramp closed. Nice hike to dinosaur footprints. We camped at Clayton Lake State Park in a Motorhome. Don't want to take motor home on roads beyond electric sites. Roads need work. Beautiful view sites near the lake. No problems with power or water hookups. Most sites are terraced so everyone has a view. Lovely. Clean and well maintained. Quite a ways from town for travelers, but so worth it. I would most definitely stay here again. We camped at Clayton Lake State Park in a Travel Trailer. 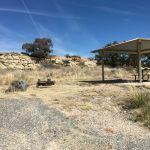 This is a small park with about a dozen RV hookups (no sewer) overlooking Clayton Lake, about 13 miles from the town of Clayton, NM. The after-hours check in instructions are confusing (we had no reservation), but we made it work. We stayed one night in site E1. The pull through site was long enough that we did not have to unhook the truck since we were leaving the next morning. 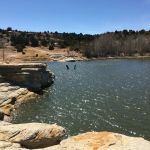 We enjoyed the dinosaur tracks and the scenic (albeit a little rough) ride out the next morning since this park is adjacent to the Kiowa National Grasslands. Looks like a great place to fish, either from the courtesy dock or launching your own boat from their boat ramp. We would certainly look to stay here on our way from TX to CO in the future. We camped at Clayton Lake State Park in a Travel Trailer. The staff was very friendly and helpful. The park is beautiful and quiet. The fossilized dinosaur footprints were awesome! We are birdwatchers, and saw our first roadrunner here. Lots of swallows swoop over the lake constantly. If you do not have a reservation, the fee is payable with cash or check only. We camped at Clayton Lake State Park in a Travel Trailer. I loved this park. It is 12 miles from town but the paved road is in good condition. The roads into the 2 developed campground loops are good but the road to the primitive camping areas is badly washed out. Of the 2 loops the one with electric and water is the least attractive but the sites all have a lake view and most are pull through. There is not much privacy between sites. There is plenty of room for big rigs. Reservations should be made for W&E sites. I found one of my best ever tent sites on the undeveloped loop. It was lakeside and very private. There was a large picnic table on a paved pad with a cover. The parking area was badly washed but I had no trouble getting in and out. The loop without W&E has a few sites suitable for RVs if you don't mind a little leveling in exchange for larger private sites. Clayton SP is known for its fishing, birding and its 500 dinosaur tracks. It's an easy hike to the dinosaur tracks. Don't miss them. I would definitely stay here again. Be advised that there are many areas in NM, even along major highways, where cell service is unavailable including this park. If you can't live without it stay close to towns. We camped at Clayton Lake State Park in a Tent. We did not stay here but would have liked to if they had the 50amp electric service that they told us they did on the phone. The views from the camp site were amazing. We camped at Clayton Lake State Park in a Fifth Wheel. Stayed in site E4 (electric and water). Site is your basic average state park. Did not use it but there is a shower house, condition unknown. It rained 3 of the 4 nights we stayed here. All the sights are on the side of a hill leading down to the lake. During the rains all sorts of debris and gravel was washed down hill. The road out of the campground was almost washed out. Park ranger was very friendly and helpful. His assistant, however, was anything but. In fact, rude and inconsiderate come to mind. Entrance to the park is down a steep switchback road. The road between Clayton and the park is narrow, winding and prone to flooding and washout. During one night of rain we were prevented from going into town because the road was flooded and closed. Be advised, there is absolutely no cell phone service available at the park. We camped at Clayton Lake State Park in a Fifth Wheel. Good for an overnight. Utilities were not super as we had to run water heater on gas. Sites pretty level. Would stay here again if passing through the area. Not real great for a final destination. Not much for the kids to do except putt-putt, which is not free. Also, you can sometimes smell the goat farm across the street. We camped at Clayton Lake State Park in a Fifth Wheel. Are you affiliated with Clayton Lake State Park ?